Nokia has unveiled a selfie-friendly smartphone double-act with its new Lumia 730 and Lumia 730 smartphones. Both phones make use of a 5MP 1080p wide-angle front-facing camera for optimum self-shot group snaps. There's also a slightly heftier 6.7MP rear-facing shooter that Nokia reckons will capture stellar snaps even in low-light. The innards are decent, with a 1.2GHz quad-core Snapdragon CPU pushing the goods to the phone's 4.7-in OLED display. There's 8GB of built-in storage with room to improve by 128GB courtesy of a microSD slot, plus a free 15GB of Microsoft's free OneDrive cloud storage. The pair will land with 2,220mAh li-ion batteries, which should be plenty to keep these mid-specced smartphones running all day. Wireless Qi charging is also supported. The Lumia 735 ships with 4G LTE connectivity, while its slightly more lethargic sibling, the Lumia 730, is dual-sim 3G only. Both devices will run on Windows Phone 8.1, and thus will have access to all the apps and goodies the Windows store has on offer. 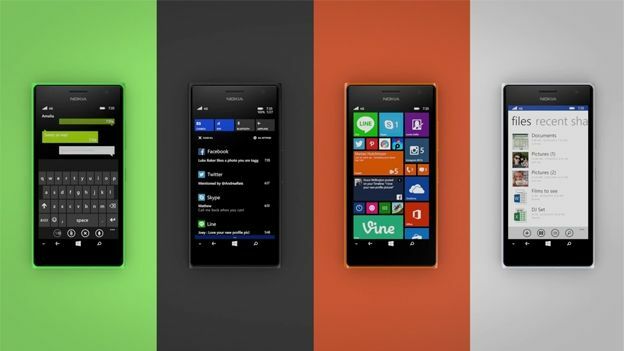 The phones will also come pre-loaded with expected Microsoft wares like Live Tiles and Microsoft office. There's also SensorCore tech built-in, meaning you'll be able to make the most of fitness trackers with the usual raft of sensors. The phones will start shipping this very month, with the Lumia 735 expected to retail at 219 euros pre-tax (£175) and the 730 at a friendlier 199 euros pre-tax (£159).